Hi guys! I hope you're having a great Saturday! I'm just vegging out and watching Supernatural. I'm a big chicken, and I can only watch it during the day when someone else in the house with me. It makes for something interesting to watch while I'm editing photos! 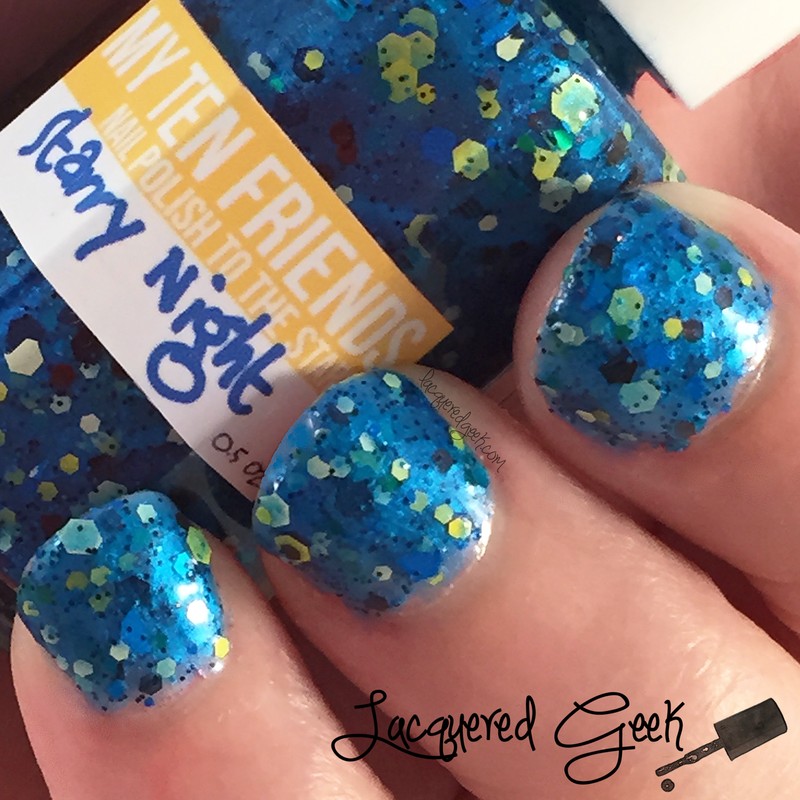 It's time for another Hobby Polish Bloggers link-up! 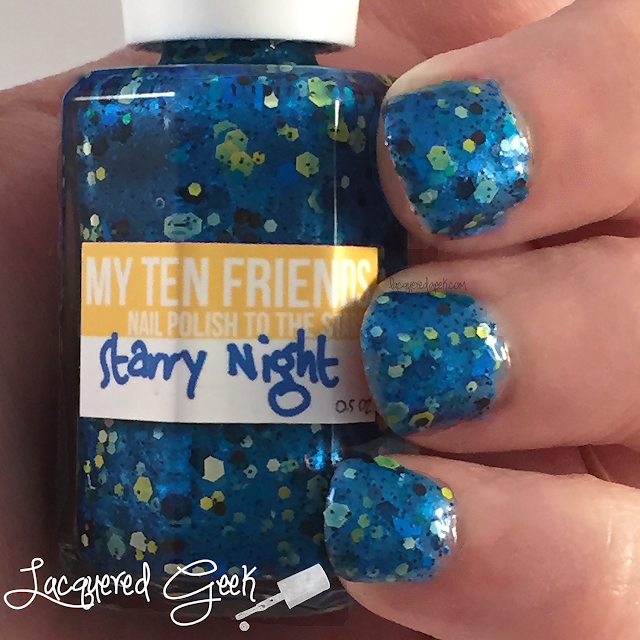 This month's theme is "Starry Night Sky," and each blogger puts their own unique twist on the theme! As soon as the theme was announced I knew immediately what I was going to do! 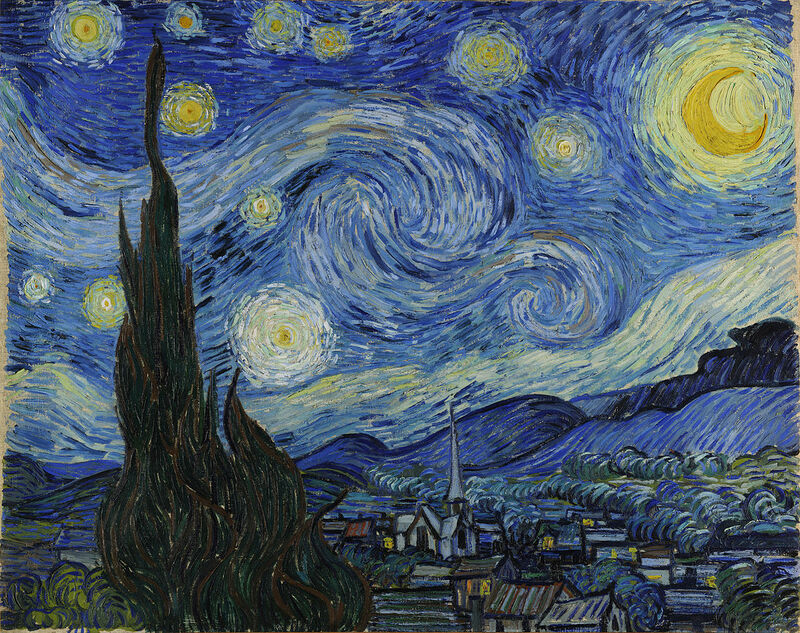 I had just received a bottle of My Ten Friend's Starry Night that I'd bought in a blog sale, and well, when I hear "Starry Night" I think of the Vincent Van Gogh painting. I thought it would be perfect! 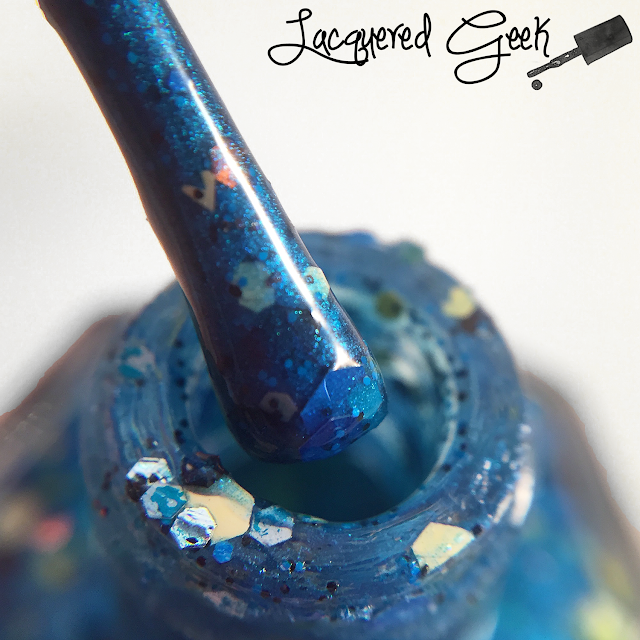 Starry Night starts with a gorgeous shimmer blue base, and is jam packed with blue, black, yellow and white glitters, and black microglitters. I wish I'd been able to snag this one from a restock when My Ten Friends was still in business. Since I got this one from a blog sale, the quality wasn't that great. It was very thick and gloopy. I had to add quite a bit of thinner to it, just to be able to use it. I used two thick coats for these photos; I couldn't have used thin coats if I'd wanted to! I've bought quite a few polishes from blog sales, and this one was the first that I'd gotten that was gloopy. Starry Night (the polish) is seriously like Starry Night (the painting) in a bottle. Look! 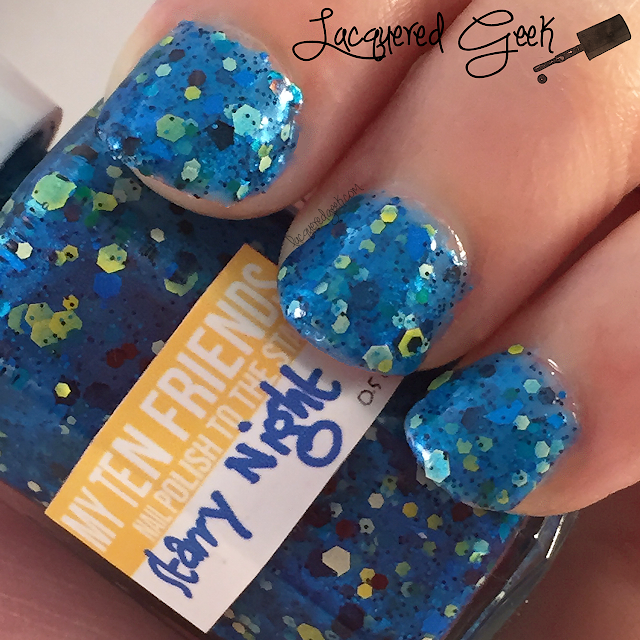 The next time that I wear this beauty, I'm going to wear it over blue undies to conserve the polish since My Ten Friends is no longer in business, the polishes are pretty rare, and I want it to last! 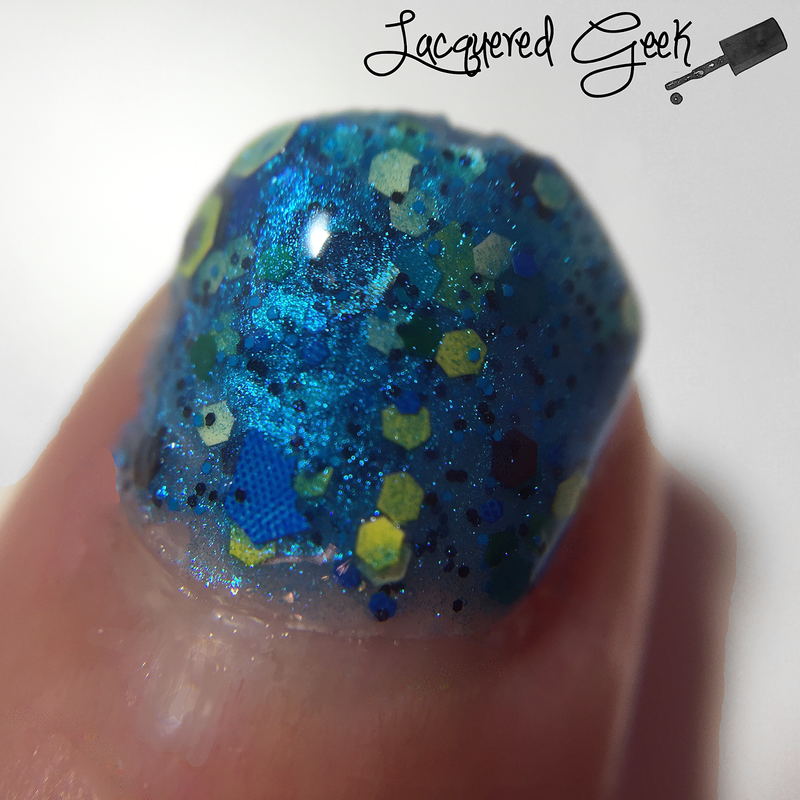 Now that you've seen my take on Starry Night sky nails, be sure to go check out all the other participants in this month's link-up! That is really pretty and it totally captures of the spirit of The Starry Night! I totally thought of Van Gogh when this prompt came up too! Gorgeous polish and such a great name for it too! I never got to try this brand before the shop closed. I'll have to keep an eye out on blog sales so I can at least get one for my collection. This polish is definitely inspired by the painting. The two starry nights that I own don't have the yellow in them. And like a few million others, that is one of my favorite paintings. I love that you included it in your post. Oh what a pretty polish! It definitely matches the painting!